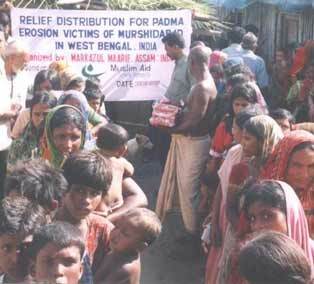 Murshidabad, 10 August*, 2005: The devastating flood and erosion of Padma river and the following hunger have played havoc on the lives of people at Jalangi in Murshidabad District of West Bengal, 400 km. from capital city Kolkata by the Indo-Bangladesh in the northeast region of India. Two Muslim NGOs - Charity Alliance, Delhi and Markazul Ma’arif, Assam are placed in the affected areas to assist the victims. Many families in villages like Parashpur, Dayarampur, Taltali, Udyanagar and Raipara on the banks of the river Padma are left with nothing. ‘Even one complete village- Parashpur is totally submerged rendering hundreds of acres of land washed away and more than 200 families deprived of their houses and belongings in the swirling river water,’ reports M. B. Qasmi, Director MMERC, Mumbai after visiting the area in July 14-19. ‘Large areas of farmland have been inundated and it blocked sources of income and livelihood of the people in the area. Added to this, the famine condition further aggravated their living conditions and the tragic, catastrophic situation is slowly but surely pushing them to starvation deaths’, said Mr. Qasmi. Markazul Ma’arif, an Assam based Muslim NGO, moved by the reported starvation deaths in Murshidabad sent a survey team in May to measure the loss and requirements of the people there. Following the survey report the Organization sent its officials- Mr. Sharifuddin Lashkar, Fakharuddin and Shah Jahan Ali- with relief commodities. The group organized local volunteers and provided the starving victims with rice (10 Kg. Per family), Daal, salt, cooking oil, baby foods, medicine, Lungi and Saries to 1200 families in 3 phases in June and July. Mr. Shamsul Haq Choudhury, Vice President of the Organization, Maulana Siddiqullah Choudhury, General Secretary West Bengal Jamiat Ulama-e Hind and M. Burhaniddin Qasmi from Mumbai have also distributed from the Organization goods to build shelters, to those who have lost shelters, and means of income to the selected males and females in July 15 and 19. So far 600 bundles of Tin to 400 families (each bundle contains 72 ft. of aluminium shields), 15 rickshaw vans to men and 10 sewing machines to women have been distributed in the affected villages as means of living and earnings in addition to food, clothing and medicine to 1200 families in earlier three phases of distribution. In all some 7500 people have been benefited by the volunteer services of the Organization. Notably, Markazul Ma’arif is rendering this relief and rehabilitation commodities in Murshidabad with full collaboration of a London based humanitarian organization- MUSLIM AID. The survey of the Organization also reveals requirements of proper educational infrastructure in the locality. Hence, Markazul Ma’arif is working to establish five schools in the severely affected villages where basic religious and primary secular schooling would be facilitated to both the boys and girls. Maulana Siddiqullah Chaudhury, General Secretary Jamiat Ulama-i West Bengal unit has agreed to look after the schools for the next five years with Markaz’s financing. Markazul Ma’arif, headed by Maulana Badruddin Ajmal Al-Qasmi, Member Shura Darul Uloom Deoband; is the largest Muslim NGO in northeast India. From the very beginning of its establishment in 1982, the Organization has been engaged in plying a key role for a sincere, devoted and altruistic service to the people of northeast region, in social, economic, educational development without discrimination of creed or cast.